If you’re like me (and most women I know), you are a master multi-tasker. You can do the laundry, feed your baby, and schedule a business appointment over the phone all at the same time without even missing a beat. You can keep working long after you’ve hit a wall from exhaustion even though lack of sleep makes it hard to keep your eyes open. And you feel like you have to be everything to everyone, so the word “no” is kept in a special box and only taken out as a last resort, when there’s just no way you can possibly say yes to one more thing (and even then, sometimes you do anyhow). I’ve especially noticed these traits in women who are self employed and work at home. Because the lines are blurred (if they even exist at all) between our personal and professional lives and environments, it’s easy to feel like we don’t have a “real” job. That belief, as well as the ridiculous assumption that we have to be everything to everybody, can create a level of stress that often exceeds the stress we’d deal with if we were going to an office from nine to five. In the past several years, I have been through no less than five assistants. Because I empower entrepreneurial women for a living, and the people I hire are entrepreneurial women, I keep coaching them right out of their jobs with me and on to other things. To be honest, every time I lose one I’m almost reluctant to trust anybody to take on too much of the day-to-day running of my business again. It’s time consuming to train someone around how to manage things like my email, customer support, and websites. Plus, I tend to be a “lone ranger” when it comes to tasks, so since June when my last assistant abruptly quit, I’ve been managing things on my own. It’s made me remember why I need someone to whom I can delegate tasks and I’ll be looking for a new virtual assistant in the new year. Plus, my husband has terminal cancer and needs more and more of my time and attention. The stress of not having a “back up” person to take over in case I’m not available has become a little too much for me. Because of that, I’m looking at everything I do now through the lens of whether or not I actually have to do it or I can pay someone else to do it for me. I’m being brutal, and getting everything I possibly can off of my plate so I can focus on the higher level work I’m here to do…create programs and products that support others to be successful. It’s not an easy process, because I arrogantly think that no one can do most of what I do better than I do. Even if that’s true, does it matter if I’m constantly stressed out and frustrated, grumpy with my family, and just generally overwhelmed? Not in my book. Things may not get done in the same time frame or the same way I would get them done, but they will get done. Delegating will cost money, and that out of pocket expense is a great investment in the future of my business. Letting go doesn’t mean it’s not still my responsibility, so I have to have accountability in place to make sure nothing falls through the cracks. I can trust people, I just have to make sure I choose the right people. The more responsibility I give someone, the more empowered they are to do a great job. Paying someone else to do something they’re really good at is a gift to both of us. 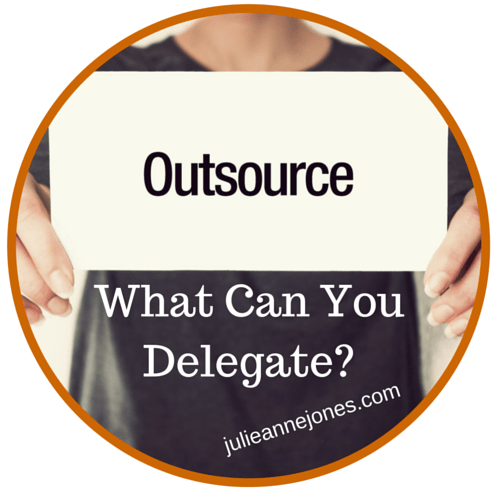 So, the question is, what can you delegate? Get really honest with yourself and start keeping a list of things others could do for you. If you don’t think you can afford to pay someone, get creative. Do they love your product? Can you barter with them? Can you put your older children, husband, or other family members to work? It’s a matter of looking at all of your resources and finding a way to make it work. Maybe as you’re making a plan for your business in 2016, you can look at how adding someone to whom you can delegate things would improve your business. I know that’s what I’m looking at.